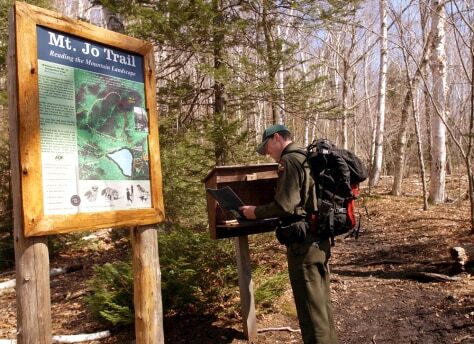 New York forest ranger Lt. Brian Dubay looks at the log book for the trail to Mt. Jo's summit in North Elba, N.Y., on April 12. Mt. Jo, a 2,876 foot mountain with a vertical climb of 700 feet and a view of Heart Lake and the High Peaks, is visited by 14,000 people each year.